Lacrosse is also considered one of the fastest growing team sports, both in the United States and abroad. In the last decade, the number of high school and youth league teams has increased by 40%, and the number of college and club teams has risen by 55%. This has been accompanied by an increased national awareness of all levels of men's and women's Lacrosse, and a growing interest in the game among countries never before involved. There are over 11,000 participants playing Lacrosse on approximately 300 men's and women's post-collegiate club teams throughout the United States. The Hiawatha wampum belt is comprised of thirty eight rows, having a heart as a great tree in the center, on either side there are two squares, all are connected with the heart by white rows of wampum. The belt is the emblem of unity among the Five Nations. The first square on the left represents the Mohawk Nation, Keeper of the Eastern Door. The inner square on the left, nearest the heart represents the Oneida Nation. The white tree in the middle represents the Onondaga Nation. This tree also means that the heart of the Five Nations is single in loyalty to the Great Law of Peace. 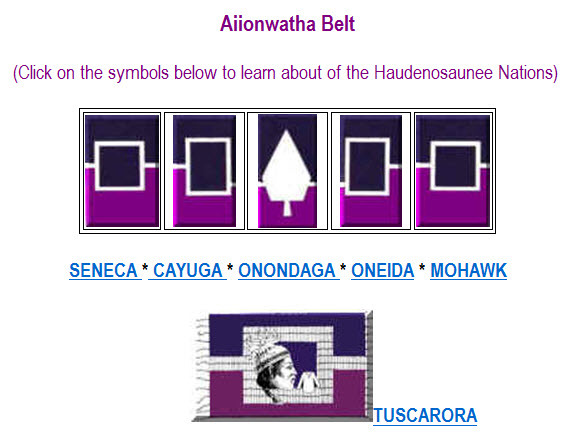 The Great Peace is lodged in the heart, meaning that the Haudenosaunee council fire is to burn at Onondaga, serving as the capitol of the Haudenosaunee. It also means that the authority is given to advance the cause of peace. The inner square to the right of the heart represents the Cayuga Nation. The last square, the one furthest to the right represents the Seneca Nation, known as Keeper of the Western Door. The two lines extending from each side of the squares of the belt, from the Mohawk and Seneca Nations represents a path of peace that other Nations are welcome to travel, to take shelter beneath the Great Tree of Peace, and join the Iroquois Confederacy.